The voices and real, lived experiences of people who have directly experienced Ireland’s abortion laws must be at the centre of the Citizens Assembly process as they deliberate the 8th Amendment. The 99 citizens who will be participating in the Citizens’ Assembly may or may not have had an experience of abortion. The Abortion Rights Campaign is taking an active role in ensuring that as many women’s stories and experiences of abortion, in Ireland or outside, can be heard. To that end, we are seeking personal abortion stories from those who have directly experienced the consequences of Ireland’s abortion laws as part of our submission to the Citizens Assembly. While we feel that the Citizens’ Assembly is a delay tactic, we must ensure that the voices of women are central to this discussion. We are concerned that the stories of women who have directly experienced the consequences of 8th Amendment will not be given enough of a platform as part of the Citizens’ Assembly process, particularly as a member of the Citizens’ Assembly had to leave when it emerged that he had been a member of a pro-choice group four years ago. Sharing abortion stories can be daunting, but there is power, strength and solidarity in numbers. 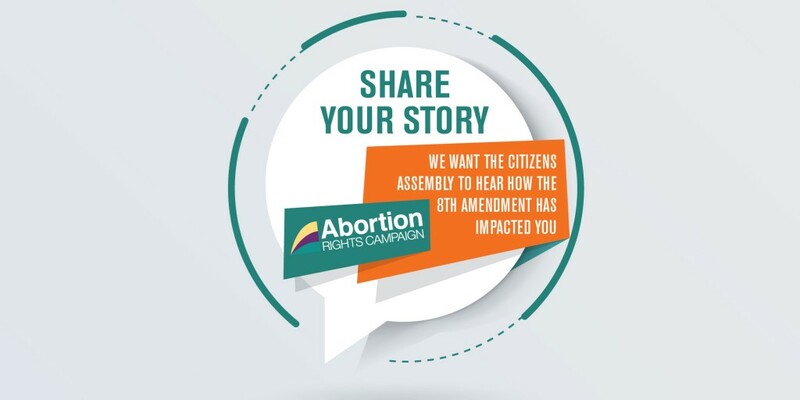 If you have had to access abortion services under the 8th Amendment and would like to have your voice heard at the Citizens’ Assembly, we are encouraging you to write your story and share your experience of what it was like to travel for an abortion. Your story will be collated together with other people who have shared similar experiences. You can choose to remain anonymous or to use your name, whichever you feel the most comfortable with. Your story will not be otherwise used or shared, and only two people have access to the secure email account to which stories should be sent. If you would like to write your personal story but are unsure of how to begin, the following questions may help (they are intended only as a guide and it is not obligatory to answer all or any of them). If you took pills for a medical abortion, we would love you to share your story. However, we strongly recommend you do this anonymously given the current criminalisation of abortion within Ireland, as there is currently a fourteen year prison sentence for having an abortion in Ireland introduced under the Protection of Life During Pregnancy Act in 2014. We also want to hear from you if you are or could be disproportionately affected by our laws. If your health or visa status could stop you from travelling, if you are a trans man, or a non binary person and feel your voice has been left out of the conversation around abortion, if maintaining your health means you would have to get an abortion if you became pregnant we want your voice to be heard by the 99 people at the assembly. Individuals are free to contribute to the ARC submission and to make an individual submission. Sending your story to ARC would not preclude you from sending your own personal submission as well, rather, we believe that there is strength in the collation of our shared experiences and we hope this document will highlight the importance of women’s voices. Stories can be emailed to [email protected] by 12th December. For data protection this email account is only accessible by 2 people. I am a student, not ready to have kids as I am still in education and unemployed, my boyfriend supports my choice. I had a surgical abortion abroad. I would not have through I could get pregnant (on the mini pill). The operation was straight forward and wasn’t painful, many women go to work on the same day afterwards. Unfortunately if you’re Irish, you have to take days off work or out of education. I was extremely relieved to have it done and happy I could get on with my life. No regrets. Now I have to visit a gynecologist to treat an unrelated condition, cervical erosion, but I’m scared to tell her what kind of operation I had last year, in case she uses it against me. Please appeal the 8. I have watched my friend travel to London for a termination which went wrong and she ended up in intensive care. She was a mother of three living with domestic violence who just could not live with another child. Please give us all the right to choose what we do with our bodies.